With Photography by Andrew Newton, used with permission. 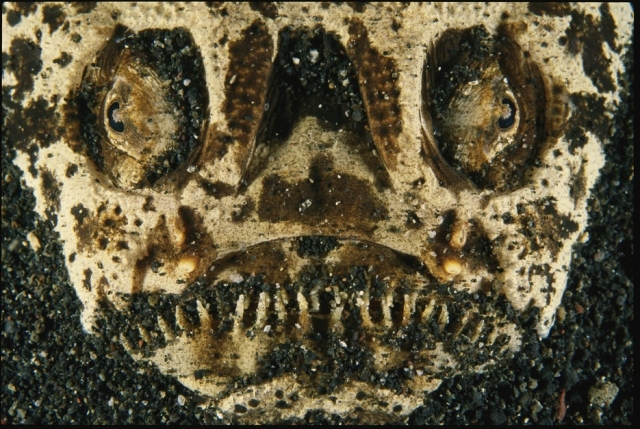 Many predatory fish employ a "sit and wait" hunting technique, but few are modified for ambush in quite the same way as the seldom seen and gorgeously grotesque Uranoscopidae, or stargazers. With sharply upturned skulls, their ghoulishly bulging eyeballs perpetually stare straight out the top of their blunt, flattened heads, their bulldog jaws twisted into a skyward frown...but what for? 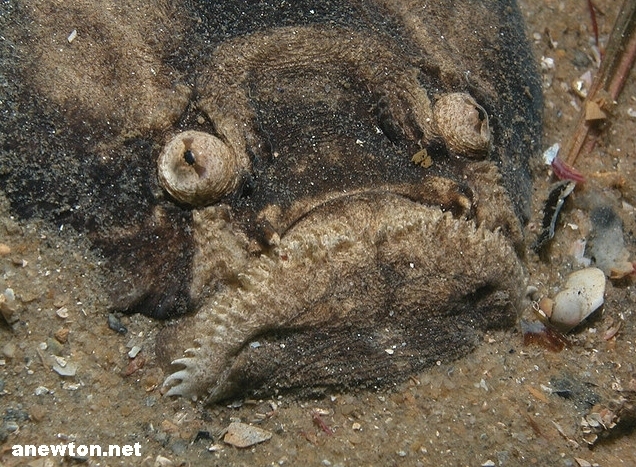 This distorted grimace allows the stargazer to bury itself almost completely under sand or mud, barely exposing a deceptively small portion of its menacing mug, the tip of the meat-eating iceberg. With so much of its bulk below ground, its jaws become like the trap door to a carnivorous hidden cavern, creating an inescapable vacuum as they snap at passing prey. They're killers who are their own creepy, secret basement. 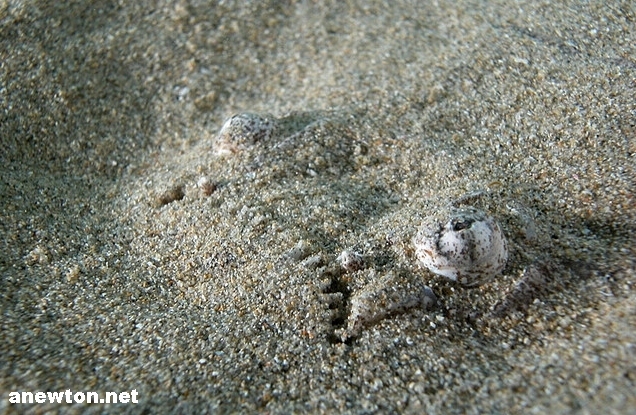 While usually concealed well enough by sediment, many stargazers are mottled and rock-like for a little added camouflage, though a few species are more strikingly colorful - even polka-dotted. 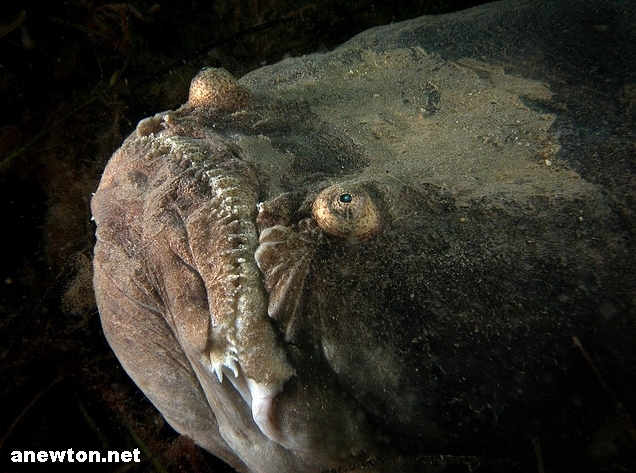 If exposed, their huge fan-like pectoral fins can quickly excavate a new hiding spot. Living booby-traps in more ways than one, all stargazers are protected by a pair of sharp, venomous spines just behind the gills, delivering an agonizing sting to would-be predators or hapless waders. Several species additionally possess a Y-shaped electrical organ between the eyes, not as powerful as the electric eel, electric catfish or torpedo ray, but powerful enough to startle attackers or briefly paralyze small prey. They're a double whammy of predatory fish superpowers, and it's still not the extent of their devilry. Taking a cue from the unrelated Lophiiformes, some stargazers entice prey with a biological "fishing lure," a false worm which flicks rapidly in and out of their mouth. Other fish see a delicious, wriggling meal only for the ground to come alive, swallow and digest them. They're shocking, stinging, luring, meat-eating sand-traps that look more than a little like Rancor beasts, but feed more like the Sarlacc. That's an awful lot of Star Wars in one animal. It's as though all the most monstrous fish had a baby together...and then hit it in the face with a shovel.